We are considered one of the preeminent research and training centers for lung imaging research using hyperpolarized helium and xenon gases as non-toxic, non-radioactive inhaled contrast agents for MRI. Upon inhalation, these non-radioactive contrast agents provide high-resolution detailed images of the lungs that show functional and structural information about the lung which cannot be obtained with any existing clinical imaging methods. Members of our faculty pioneered the application of hyperpolarized gas imaging for a variety of lung diseases including asthma, cystic fibrosis (CF), and bronchopulmonary dysplasia (also known as chronic lung disease of prematurity); we also pioneered a number of hyperpolarized gas acquisition techniques, including methods for diffusion weighted imaging, characterization of gas exchange, direct imaging of dissolved xenon, and dynamic imaging of gas inhalation. Our hyperpolarized gas MRI research center at UVA has imaged more human subjects than any other site in the nation. Hyperpolarized gas imaging requires custom polarization systems for preparation of the gases and dedicated transmit/receive radiofrequency (RF) coils tuned to the helium-3 or xenon-129 resonance frequency. Our group constructed the first high-yield, hybrid helium-3 polarization system for hyperpolarized gas MRI, which provides polarization levels of more than 60 percent. Our division’s RF coil laboratory has built an assortment of custom RF coils for imaging human and animal lungs. Hyperpolarized gas research and operations at UVA are united within the Center for In-vivo Hyperpolarized Gas MR Imaging, established in 2000 by a grant from the Commonwealth of Virginia Technology Research Fund. Ongoing research at the Center focuses both on methodological advances and clinical applications of this technology for the understanding, diagnosis and treatment of disease. 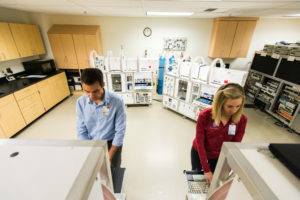 The Center shares two whole-body MR scanners (1.5 Tesla and 3 Tesla) with other researchers in the Department of Radiology and Medical Imaging and operates two gas-polarization systems. More than a dozen MR physicists, biomedical engineers, physician investigators, and trainees use the Center’s resources for a variety of hyperpolarized-gas projects. Core staff includes an MRI technologist and a study coordinator, who also serves as a Research Nurse. A weekly group meeting is held at the Center to discuss ongoing projects and present results.